A recent article in Slate magazine offers: “Tips from the Nation’s Top Divorce Lawyers on When, Where, and How to Split“. The “top divorce lawyers” are from a group which I started in 1990 and has been meeting annually since. The group currently has 20 members with the only rule being that there cannot be more than one lawyer from one state. The article has several errors. For one, our name “Family Law Roundtable” has nothing to do with King Arthur’s court or with Monty Python. 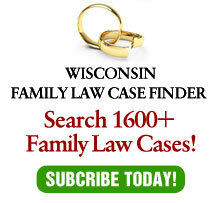 More importantly, Wisconsin is listed a community property state, which it is not for divorce purposes – our divorce property division follows Equitable Distribution rules. Otherwise, the article is a bit disjointed (what does pet custody have to do with when and where to file? It seems that it comes from a different article altogether. And what Kim Kardashian has to do with this escapes me. Still, it was fun to be interviewed for the article and for those who might find it entertaining, go ahead and enjoy.